Rioter-terrorists hurled a hand grenade and a pipe bomb at IDF soldiers. 2 Arabs are reported dead, 100 injured. A new weapon has been used in the ongoing conflict along the Gaza border: terrorists attached an explosive charge to a large helium balloon that can travel for long distances. At least 10,000 Arabs have been attacking IDF forces and storming the separation fence Friday at five points or more along the Israel-Gaza border. Rioter-terrorists hurled a hand grenade and a pipe bomb at IDF soldiers, as well as the balloon carrying an explosive charge – which apparently blew up in mid-air. The IDF has been firing at the rioter-terrorists in a way that is calculated to cause them to keep their distance. In addition, the IDF has used other means for riot dispersal. Three Arabs have been killed, according to Arab reports, and over 400 injured, seven of them seriously. The Arabs claim five journalists are among the wounded. The Arab mob has also been setting tires on fire and throwing rocks at the soldiers and at the fence. In addition, the Arabs have been flying kites with incendiary devices attached, with the purpose of setting fires inside Israel. At least six fires have broken out on the Israeli side of the border – all caused by the "incendiary kites." Fires were reported near Kibbutz Nir Am, in the Be'eri Forest, near Nahal Oz and near Kerem Shalom, where one soldier was slightly injured from smoke inhalation. The mass riots along the border have been a weekly event since March 30. They are called "The Great March of Return" and are apparently intented to distract and demoralize Israel and possibly provoke a large scale response by the IDF. At least 123 Arabs have been killed in the confrontations, most of them Hamas operatives. Israel has responded to the attacks with tank fire and fighter jet bombing raids, which have only targeted infrastructure. 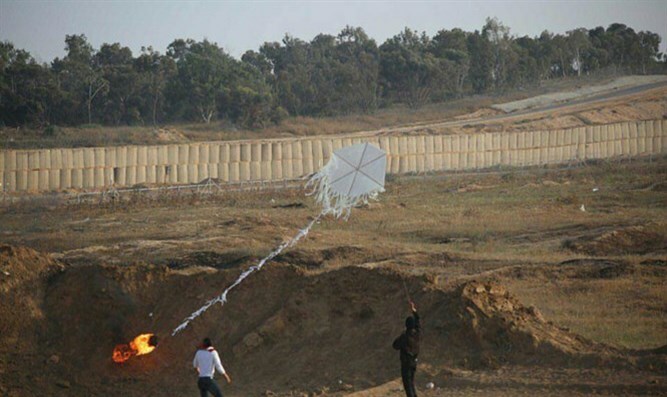 While attempts to breach the fence have been repulsed successfully by the IDF, the IDF has yet to come up with an effective way to counter the incendiary kite tactic. On May 29, the terrorists fired 25 mortar shells at Israel. One shell exploded inside an Israeli kindergarden just minutes before in opened.